The GL's LinkTest™ DUAL is a sophisticated bit error rate tester in a compact, hand held package with dual interfaces and a full color display. The unit can test a wide variety of communications facilities and equipment including T1, fractional T1, E1, fractional E1, T3 and E3 modems, multiplexers, CSU/DSUs, T1 CSUs, DTUs, NTUs and TIUs. 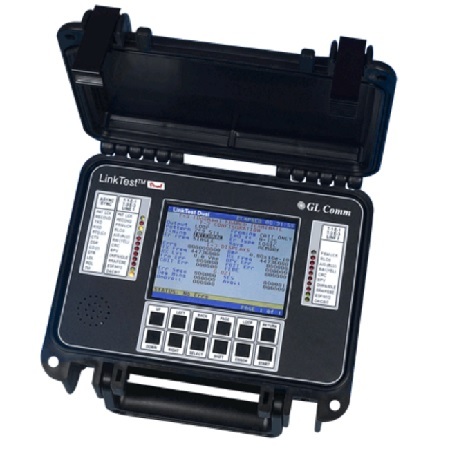 The LinkTest™ DUAL can be controlled from the front panel or from the local or remote terminal. TheIt includes built-in LAN interface which allows the unit to be controlled remotely using TELNET or TFTP. andAlso included is RS232 console port that allows unit to be controlled (locally & remotely over a dial modem path) using VT100 interface or using command line interface.